I was walking by the United States District Court in downtown Los Angeles, when I saw two mules standing on the courthouse steps. I had to investigate what this was all about. It turned out that the federal government was prosecuting a man for disobeying a “lawful order of a government employee” and for “camping outside designated areas” of a National Park. In other words, John Sears and these two mules had been walking all day and needed rest. Mr. Sears found a resting place with no one else around and fell asleep. He had no notice that doing so was against the law, or that he was even in a federal park. When the park rangers woke him and ordered him to leave, he refused because traveling through the darkness would have been unsafe. I further learned that, at that very moment, this man was defending himself at trial against these federal charges. I desperately wanted to watch this trial, but I needed to be at a hearing in another courtroom across town. Instead, I gave my business card to one of the kind people watching the mules, and explained that I would be happy to provide free legal services to Mr. Sears if he ever needed my assistance. I had just recently had my own dealings with the “Environmental Crimes Unit.” I defended a man accused of the federal offense of walking a dog without a leash in a National Park. In that case, I was fighting against the same Assistant U.S. Attorney who was prosecuting Mr. Sears and against the same park rangers who had arrested him. So I had a pretty good idea what Mr. Sears was up against. I figured that I would never hear from Mr. Sears, but a couple of months later, I received a call informing me that he had just been arrested again, this time by Ventura County law enforcement. I agreed to help, but, as it turned out, Mr. Sears didn’t need any help because the case was almost immediately dismissed. Soon after, Mr. Sears himself called me. After we spoke about his federal case, I told him that if he wished to appeal his convictions, I would be happy to represent him pro bono. 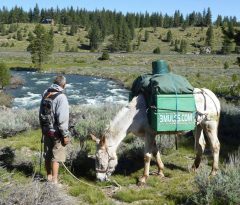 Instead of treating the Mules as criminals, the federal government should be hailing them as modern day examples of how to use and relate to our national parks. I found the Mules and the way they must live on this earth to be the embodiment of the American Spirit moving freely with the natural flowing energy of this earth. All he wants is to be free – free to roam the great, yet ever-shrinking, American outdoors. In its response to our appellant brief, the government wrote, “Allowing individuals to camp wherever they wish would create a free-for-all on public land” as if this were a bad thing. But freedom for all is what we are fighting for, and freedom is what Mr. Sears’s journey represents.